Frearson screw-heads are much like a Phillips head. They also have cross-slots but are V-shaped with tapered sides. Although this screwdriver may fit into many different slots, it is best to use the driver that matches the proper size. Cross-head, or Phillips screw has an X-shaped slot and is driven by a cross-head screwdriver, designed originally in the 1930s for use with mechanical screwing machines, intentionally made so the driver will ride out, or cam out, under strain to prevent over-tightening. 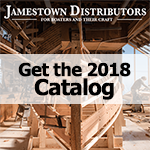 Jamestown offers many square drive screws, which have increased in popularity in the recent past because of the trend of do-it-yourself deck projects. These drives have a square head to grip the screw better on all four sides and provide better torque and range in size from 0 -3 and jumbo. Generally large, heavy-duty screws. The tip of the driver is flared so it is wider than the driver bar and can fit more easily into the screw. High quality drivers should be ground for all-around uniformity on the tip. The blade however should not taper too much from the tip because an improper taper can cause it to slip out of the screw slot. The blade of the screwdriver should fit snugly in the slot, and it should be as wide as the head of the screw to prevent it from slipping out of the slot and marring the project. It will also prevent damage to the screw's head and screwdriver tip. W. L. Fuller Co Inc. is a family owned, third generation, manufacturer of the best Countersinks, Counterbores, Plug Cutters, Taper Point Drills, Brad Point Drills and Step Drills made 100% in the U.S.A. today. With over 40 years experience manufacturing tools to cut woods, plastics and metals, we can recommend and supply the tools you need to get the job done while saving you time and money. All of our products carry our "Satisfaction Guarantee". Most orders are shipped the same day they are received. Additional Drilling and Driving products are available from Freud (Forstner Bits), Stanley (Nut/Screw Drivers. Drill bits are used in power drills, traditional hand drills and presses.